PopJulia.com is an online fashion store. The boutique ecommerce site sells dresses, tops, bottoms, shoes, accessories and other types of clothing including two-pieces. Customers can shop for shirts and blouses, t-shirts, tunics, kimonos, camis and tanks. There are chiffon tops, rompers, jumpsuits, capris and pants, skirts, leggings and shorts. 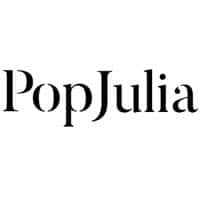 Pop Julia also sells cardigans and sweaters, sweatshirts and hoodies, coats, jackets, parkas, trench coats and homewear among others. There are flash deals and promotional offers on all items including shoes and accessories such as scarves, boas, necklaces, earrings and bracelets. There is an upfront 15% discount for shoppers who sign up and free shipping for orders worth more than $119.